I love these owls. They are so cute. 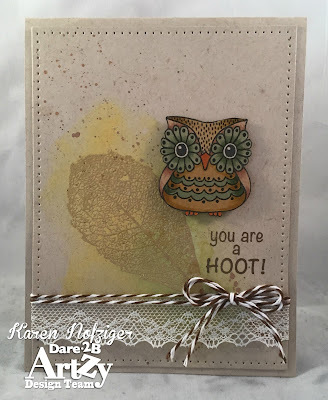 To make the card, I stamped one of the texture stamps and web embossed it with Ranger gold embossing powder. I added some distress oxide inks in Fossilized Amber and Peeled Paint and sprayed with a bit of water to blend. I die-cut the background with Elizabeth Craft Designs Stitched Rectangles. The owl is colored with Copic markers G40, G43, Y26, Y28, E41, and E42. Have you liked us on Facebook??! Do it! :) And thanks for stopping by! I love how beautiful you colored the owl! !Super cool card!